One of many terrible things about Sunday (other than doing laundry, grocery shopping, and vacuuming) is worrying about what to pack for lunch all week. This, like many loathsome chores, is especially irritating because of its repetitious nature. Unless you want to literally eat the same thing for lunch every day of your life (an acceptable strategy for breakfast, but not for lunch), then you’re faced with this decision every single Sunday. And if you also happen to be someone who struggles with making decisions, then this can quickly turn into a insurmountable obstacle, setting you up for a week of frustration and disappointment. Yes. I do mean to make it sound that serious. 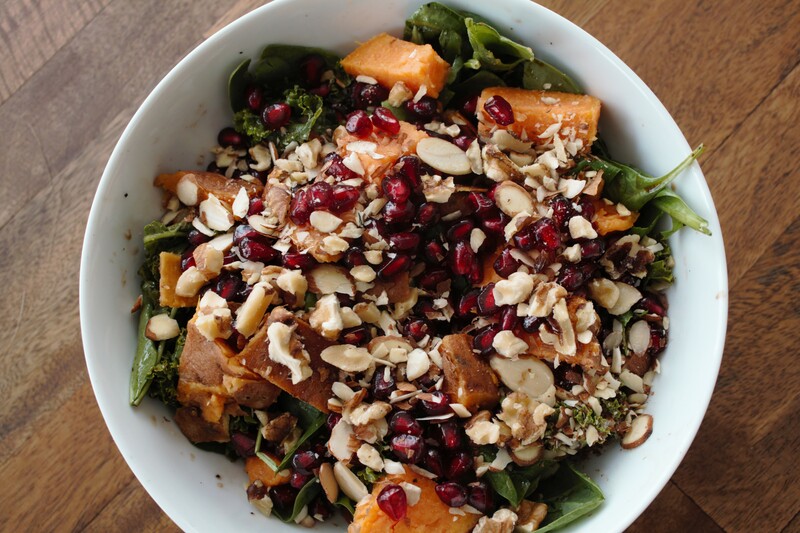 This week, my solution to the problem (giving me another 7 days before I need to stress out over this crisis again) is what I’m calling a “Winter’s Not That Bad” Salad. Something that’s kind of a bummer about winter in a cold climate (other than the obvious things) is that the produce is kind of a let down. It’s not as easy to fill up on fresh fruits and veggies as it is all summer. However, there are a few things that are good all year, and there are a few things that make their select appearances in the late fall and winter months, and we might as well make the most of those things and enjoy them while they’re here. 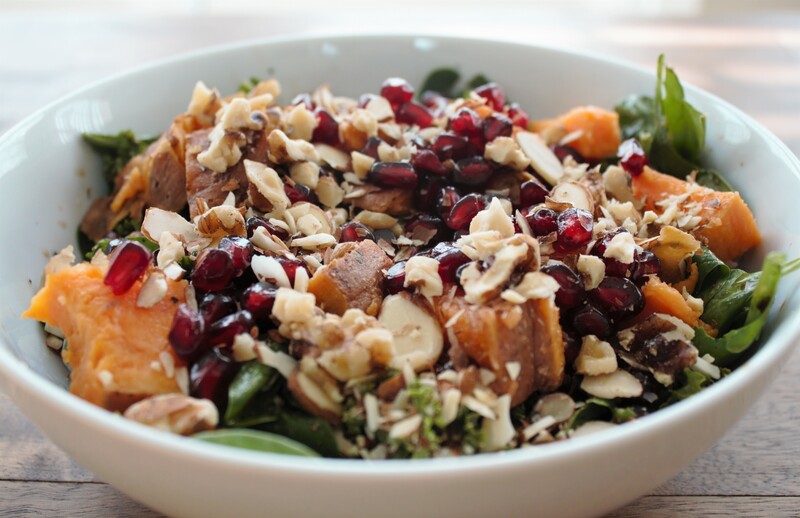 Specifically, this salad is covered in pomegranate seeds and a roasted sweet potato. It’s tough to find a good pomegranate at other times of the year, so I’m enjoying them while they’re easy to get! 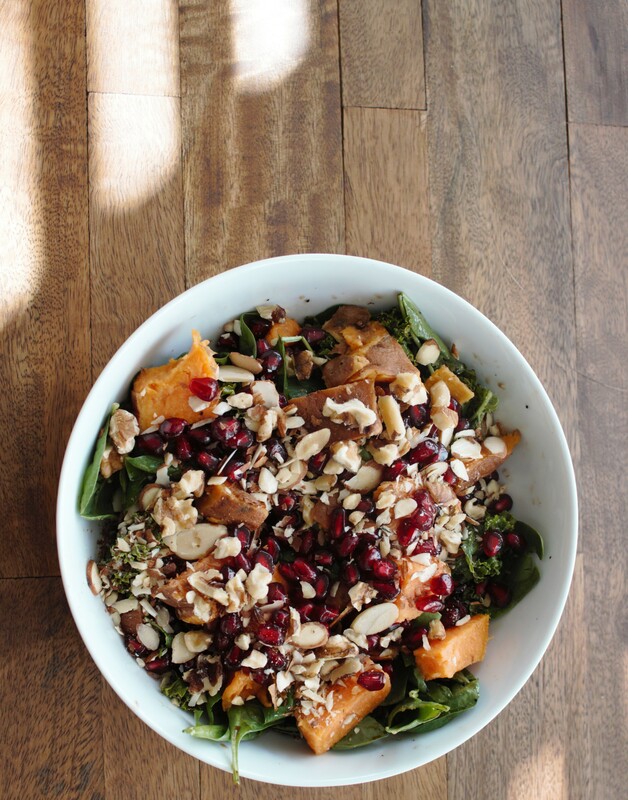 This salad is easy to throw together and pack for lunch too which is why it’s on my lunch rotation list. I roast my sweet potatoes at the beginning of the week and keep them in the fridge until I’m ready to assemble a salad. I also pop the seeds out of the pomegranate and keep them on hand to sprinkle of the salad. And I try to never be caught without a copious supply of nuts in the fridge, so this is easy to throw together in the morning. Once again your salad creation sounds delicious, and looks great! You’ll get me motivated yet to eat healthier…..thanks!! Thanks! Wish I pull stay motivated myself!